No discernible identification seen. There are other photos in Shipspotting. @Phil English, the name on the plate is Kvichak for Kvichak Marine Industries now named Vigor. I'll sure agree with this; I had no idea the LSC vessels existed. Thank you all. Definitively a match for LSC 1 or 2. All the info I found was on shipspotting or the Incat Crowther site, both sources claiming that these were used by the Navy Seals but I found no other evidence for this. I don't discount the appearance of size, and certainly other details are different. The superstructure, hull, and definitely the transverse bow say we're in the right family. I look forward to more suggestions. Thank you all for your contributions. Four others, built for Command Marine, were originally named SPEED COMMAND, SWIFT COMMAND, SPRINT COMMAND and STRIDE COMMAND. The first one was later renamed MARGARET JILL than CAPTAIN SOTIRIS. The second one was renamed SPEED TIDE in UK. The last two went to the US Coast Guard as SEA HAWK (WSES 2) and SHEARWATER (WSES 3). Both were sold, the SEA HAWK becoming the GLORY AFRIQUE in Nigeria. I found an IMO number for this (8993954) but no pictures. I also meant to say that there is a small plaque on the rear of the superstructure with a fish logo and a word similar to "Pilchard". I thought that might indicate the boatbuilder or designer. This, I’m sure, is a Dash Boat. That’s the name for a 110-foot SES designed by Bell-Halter (later Textron Marine Systems). But I’m at a complete loss to identify which one this might be. To my knowledge, 6 were built. The prototype was purchased by the U.S. Navy (also tested by the U. S. Coast Guard) and later lengthened to 160 feet, so although I don’t know her present whereabouts, this is definitely not the one in your photo. 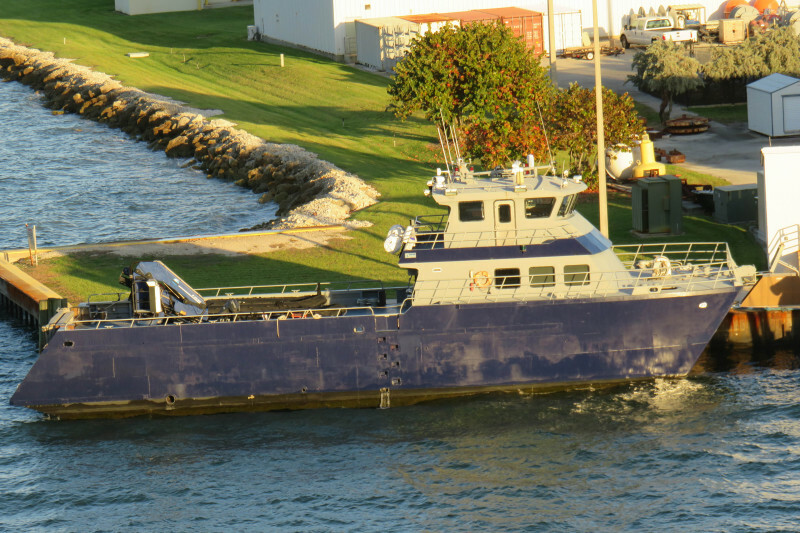 A company called Command Marine ordered four of them to be oilfield crewboats. They might have taken delivery of one of them, but all ended up back in the hands of Bell-Halter. The first two they chartered out, one as SPEED TIDE, the other as MARGARET JILL. Both were reported sold to British interests, and in photos, both had a much bigger house than shown in this photo. The Coast Guard later funded three of them for drug patrol. Two of theirs were the two remaining Command boats, and one appears to have been new construction for them. All three had this abbreviated superstructure. Of these, one is heavily modified and working as a seismic boat now, and the other two were sold to Nigeria for use as security boats and reportedly promptly sunk by nefarious forces. My best guess is that this is one of the two Nigerian ones that, in fact, never made it overseas. It looks like a divers support vessel, with the two military looking zodiacs, the crane to handle them and small recesses to act as a ladder on the side of the hull.